Yoga for Arthritis Teachers Memberships are open to YFA trained teachers. 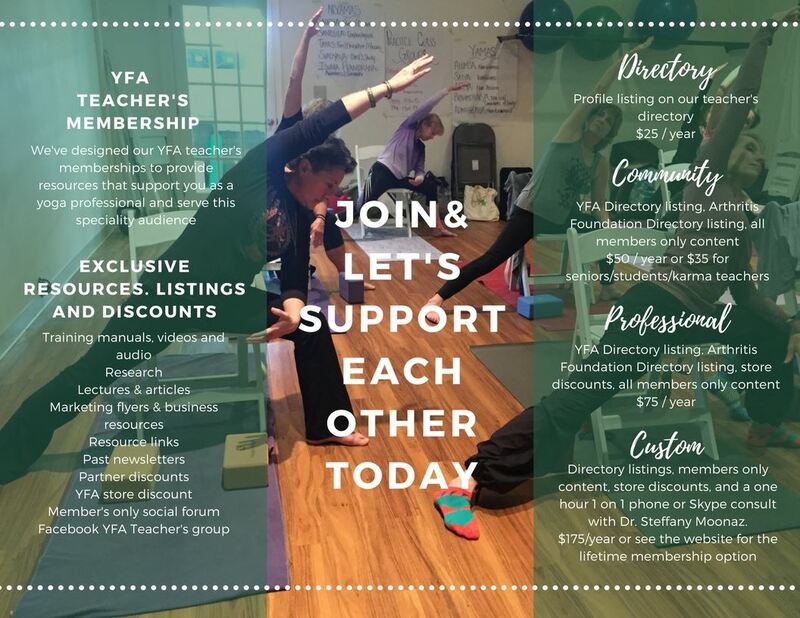 We want to support you in your teaching journey by offering exclusive content, marketing opportunities, and discounts on YFA products. The levels of membership are the same for Level I and Level II Certified teachers. Please use the navigation bar above to use the page relevant to your training level. The directory level includes your photo and contact info on our teacher's directory so potential clients can find you. You can see that directory HERE. The Community Level provides you a listing in our teacher's directory, class listings on our class finder, class listings with the Arthritis Foundation on their Resource Finder and access to exclusive online content which includes training materials in a digital format, yoga research, recordings from past trainings, marketing and business materials, and two YFA teacher's forum's (Facebook and/or on our website). The Professional level includes all of the above benefits plus a 20% discount in the YFA store including Student Manuals, DVD's, and YFA logo gear. This level includes all the benefits previously available to YFA member teachers. This level includes all of the benefits of the professional level. In addition, you will receive a one hour one on one session (via phone or Skype) with Dr. Steffany Moonaz that you can devote to your personal yoga needs, development as a YFA teacher, or business mentoring. 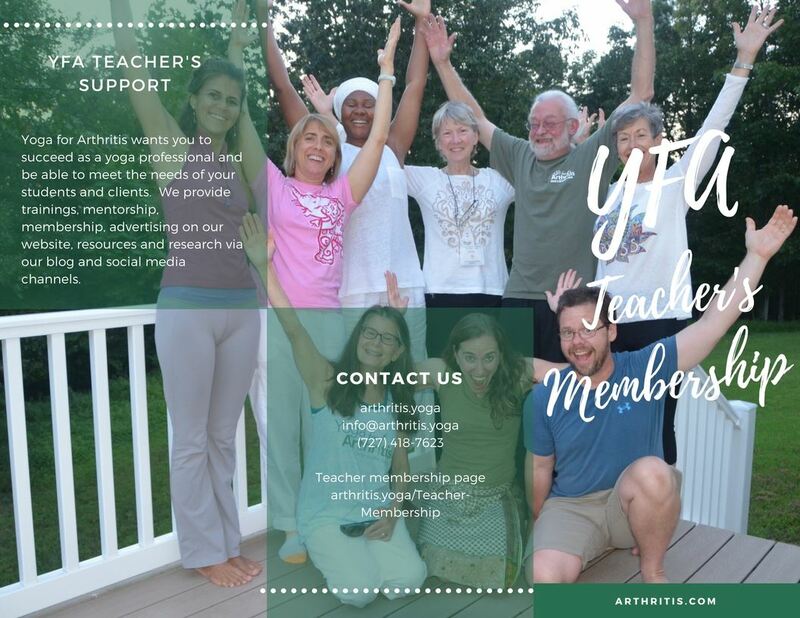 Open to any of our YFA teachers, lifetime members receive lifetime access to the membership section of the website, a personalized signed copy of Dr. Moonaz's upcoming Yoga Therapy for Arthritis book, a 1-hour consult with Dr. Moonaz plus 30-minute follow-up at a later date and a lifetime partner level acknowledgement on the website. That means in addition to the registry profile and lifetime class listings, you receive credit on the homepage with links to your business information. You also receive a lifetime 20% discount on products in the YFA store. If you're currently a member, and are having trouble upgrading your level, please email the Program Director, christa@arthritis.yoga directly to set that up for you.